How's your day everyone? It's already in the mid of December, Christmas is coming!! One thing for sure, it's almost 2016. Whew, 2015 has been very dynamic year for me, and i hope i can do better in 2016! Guys, do remember that every day is a gift from God. If you are alive now, it means God has plans for you to accomplish! It means you have to do something from the very best of you, give back your talents to God! 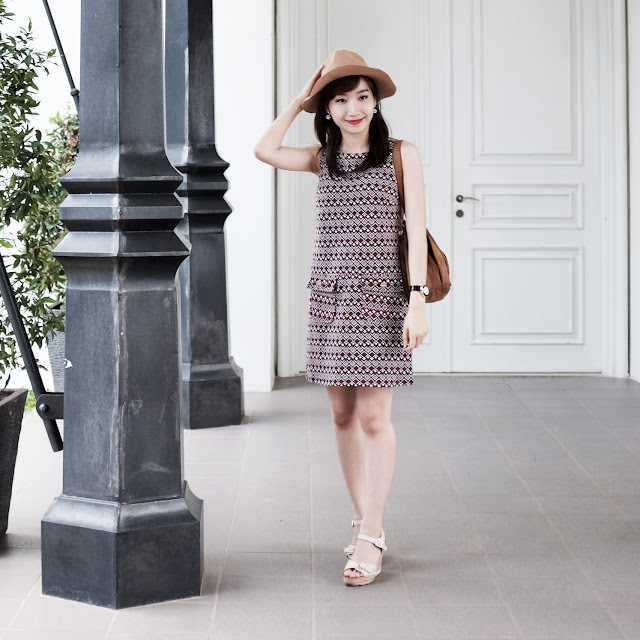 Picked myself this lovely geometric shift dress from Dorothy Perkins Indonesia latest collection. This dress is beyond comfy. I thought that this item's gonna make me look older, i don't usually wear maroon color. Turned out that this dress is very, very chic! Without looking older, i can still keep myself look simple and neat in this dress. Not to mention the fabric too, so comfy, perfect for humid weather in town. The fitting drops nicely on my body, light weight and even has a little 'body- hugging' effect. It's stretch!! This dress is from their new arrival Style Heroes. Go grab yours, while it's still available on stores! Every lady needs at least great shift dresses because this type of dress is just very simple to be worn with almost anything. The color is also nice for this Christmas! I had this blog since i was in junior high school. At first, it's just for my platform to share and keep my datas or photos. Since then, i began to love writing! I think, writing makes my language ability grows better and i can create concept or story nicely. Plus, i am more a right- brain sided, so i came from an artsy background. I really really love to paint, draw, i love to make DIY projects. I made my own clothings, pencil case, and so on. I love to take pictures, but also love to be captured. But for some reasons during my teen (especially school makes me very busy so i can't make my time writing on blog), this blog somehow were left behind. I started to write and be productive again at my end of senior high school. Then suddenly i realized! They are not living my dreams, and they are not in charge of my own activity and happiness. So i continued my blog and i don't care what people say about me, because i found myself really happy when i blog. I don't do criminals; i'm doing good and creative in my blog. So why would i be ashamed or in doubt? Up until now, i frequently received some mock subtly. Example, it happened when i was going to an event- an invitation from a company to bloggers. I went to the class first to finish my exam, but simply because i'm going to attend an event, i dresed up nicely and neat to the college that day. It's not eye- catching outfit to make people stares, but neat enough. I was wearing a black jumpsuit with a belt, flat shoes and carried handbag. It's normal. But then one of my good friend asked me: "Wow, you look incredibly neat and nice!" i know it's sincere. Then, my other friend (not so close friend, rarely talk at class) responded: "Of course, fashion blogger". Seems nothing wrong with this sentence right? But the way she said that sentence is not sincere; i heared mocking inside her voice. I know i can't really descrive voice here in words, but you just know when someone is mocking at you, right? ;) Starngely, i found she always likes my pictures on my Instagram. Hahaha, so cliche. It's not just her, there are a lot. She's not a hater of mine, but i guess she's just felt insecure, or probably jealous. I'm telling this story is not to talking about someone, but the highlight is: Don't be like the teenager me! Pursue your dreams, keep doing what you're good at. No matter how people will say about you, just keep going, chinn up and be bold. It's what i'm doing now. It's not a show off, but it's my responsibility to build up my character and capabilities through my talents and passion. I will blog and no one's gonna stop me, because i love to make some work. And for those who always mock; remember, you don't even grow higher if you keep on mocking or find other's mistakes. Just be the best version of you, until you don't have time to spying someone just to find their mistakes. Be better every day, and let's be a productive person. Cheers!